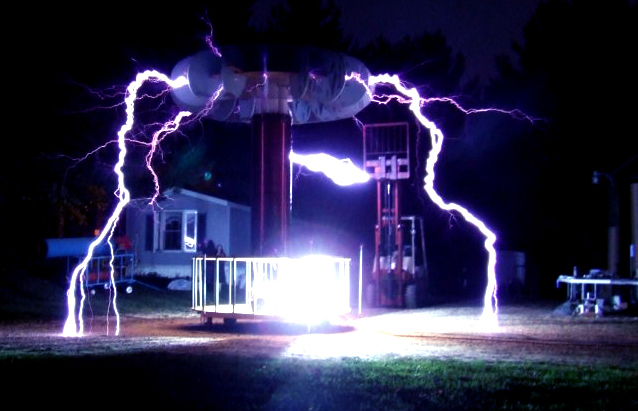 We wrote about the full scale high-voltage and Tesla experiments going on in Russia, producing 100 meter lightnings and other spectacular effects in the surrounding forest. 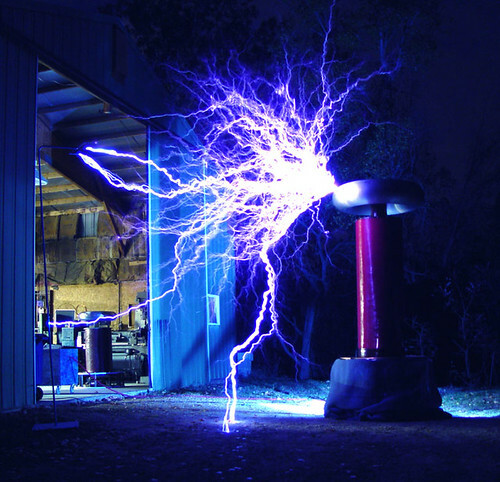 These effects proved to be too fascinating to pass by, as many inspiring scientists in various countries are building small scale replicas of Tesla and other high-voltage equipment in their backyards and garages. 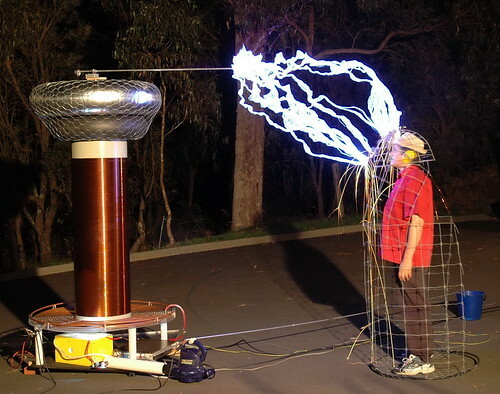 We've been sent a number of images, electrifying enough to scare some fire departments - proving that this backyard activity is popular not just with curious engineers who want to get a quick "buzz" but also with photographers. 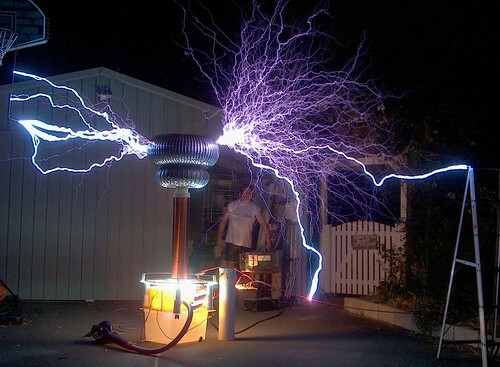 Russian "Master" sends his chair "back to the future"
With kind permission of Master we show here his experiment with DIY Tesla set. 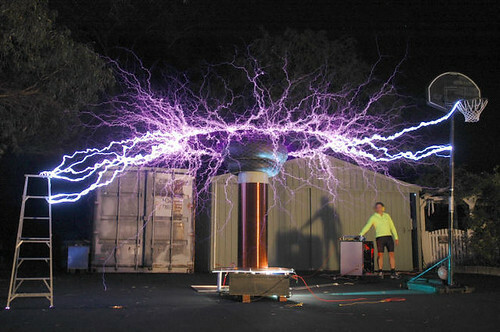 His impressive results include a 5 meter long high-voltage discharge, which converted a normal chair into an "electric" one, and a demonstration of fluorescent tubes glowing purely from the rig's surrounding electro-magnetic field. Other friends of Master also tried a lesser-scale set-up, made from the dozens of used tin coffee cans. 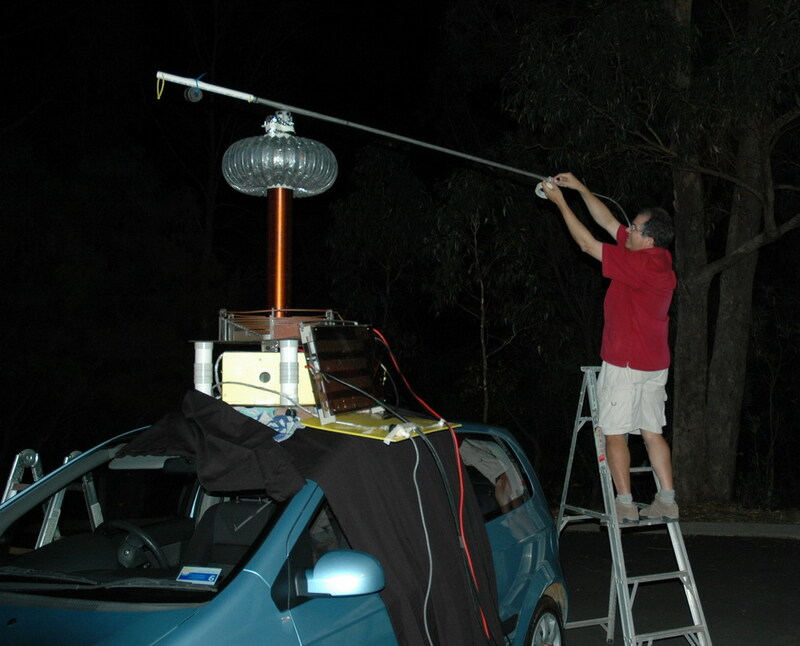 You can observe bigger Tesla installations in action on Peter Terren's site Tesla Down Under. 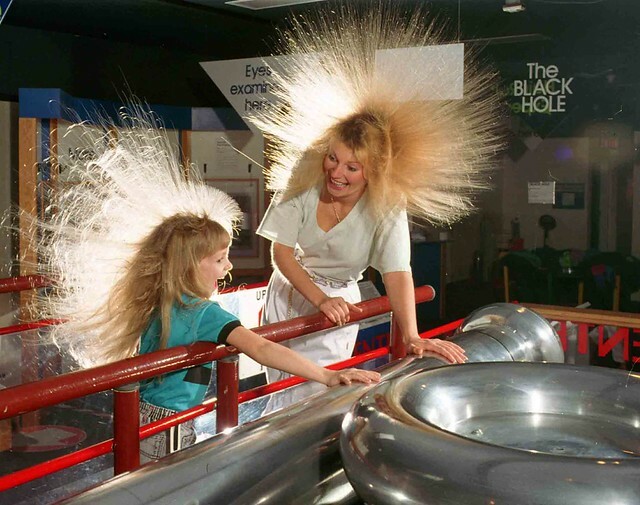 With his permission, here are some of the most spectacular images from his hair-raising experiments. 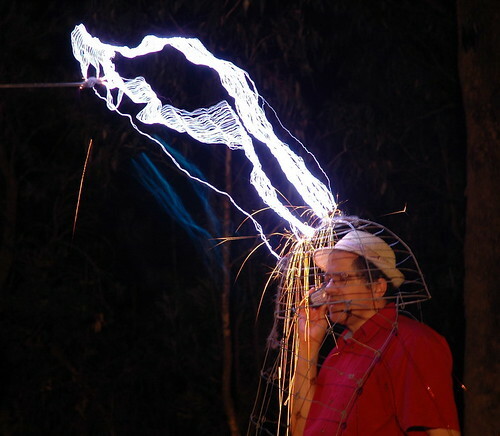 Note, that Peter basically works with the equipment on his own, with a little help from his interested kids - so it's really quite impressive that he came up with such an extensive catalog of electrical phenomena found on his site. 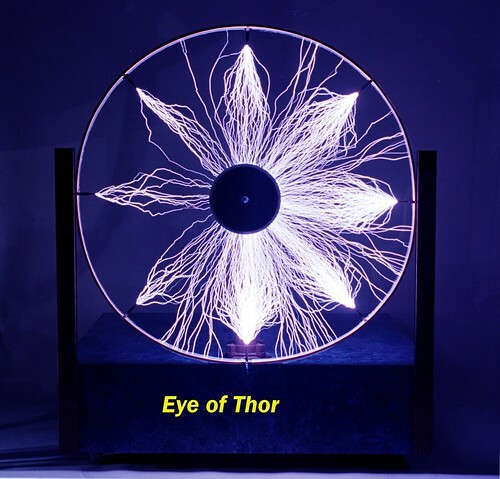 "Sauron's Aura" is even more striking - the Tesla coil is mounted 11 foot (3.3 m) in the air and the rotating rod is attached to a long beam. 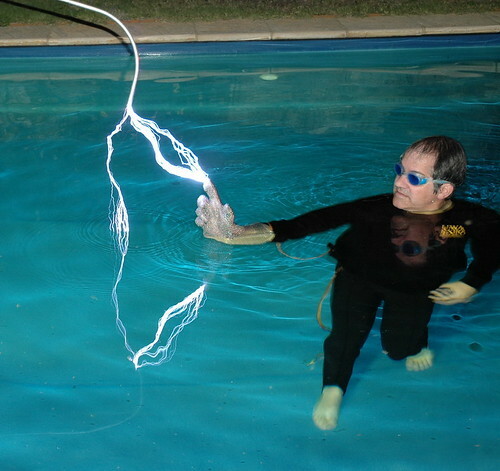 Peter also conducts some very odd looking experiments with "swimming pool sparks" (do not try to imitate this, as you definitely have to know what you are doing). Peter says, "The salt water pool is very conductive like a big ground so there is absolutely no sensation. 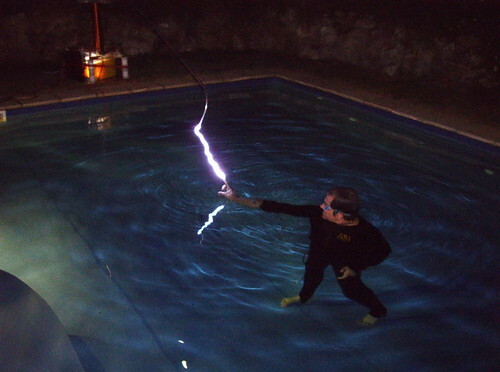 People associate water and electricity with danger. Like dropping the hairdryer in the bathtub. But the danger only occurs if the water forms a path to you then ground ie if you touch the taps, bath drain or wet grounded floor. The chain mail glove has a copper braid attached otherwise it would be a problem if I had my hand right out of the water." Just the sort of activity we'd like to do after a stressful day in the office. 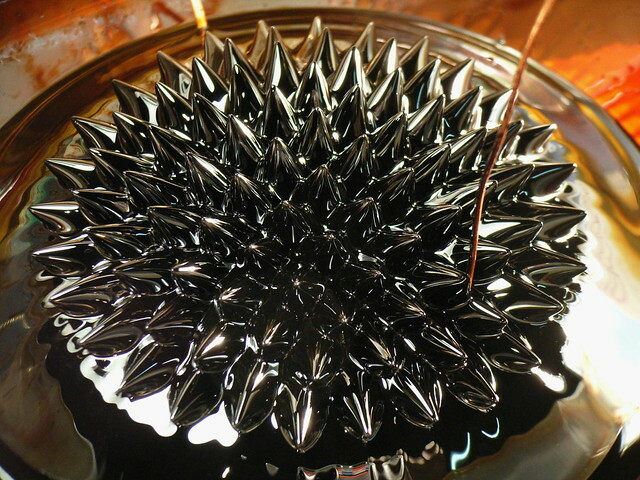 or playing with ferro-fluids... We could spend all day on his site. Interestingly, lighting does not fork; it converges. 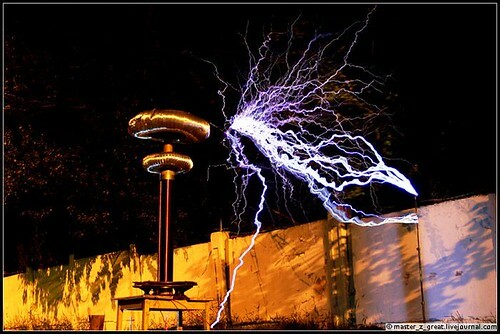 The Tesla coil is, then, the terminus of the lighting, not the originator as you might think. I learned this from a meteorological friend of mine. He said that almost all of the lightning strikes we see photographed are ground-to-sky lightning; the true sky-to-ground bolt is very rare. fascinating comment... I did not know this. Me neither. Great but dangerous experiments. 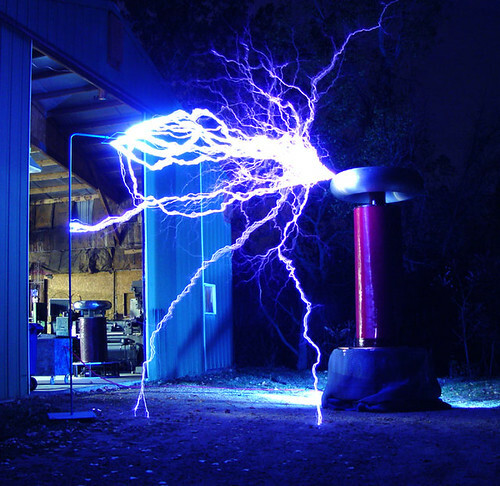 Lightning and tesla coil discharges are very different things. 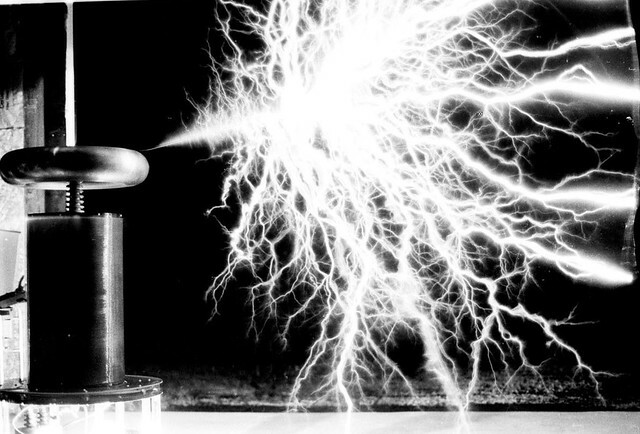 About the only thing in common is that they are both electrically induced air plasmas. 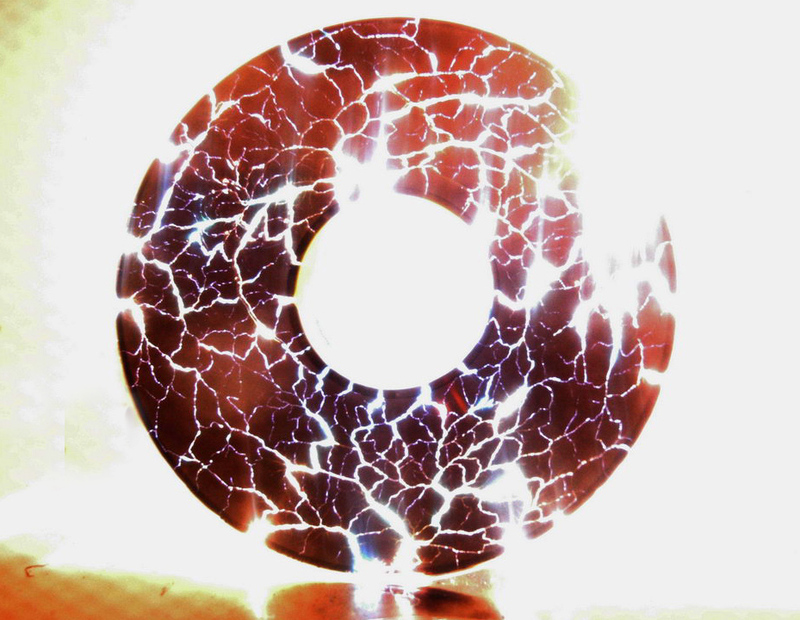 Lightning is a pulsed DC current, produced when volumes of electrostatically charged atmosphere discharge to ground (or to another area of opposite charge.) 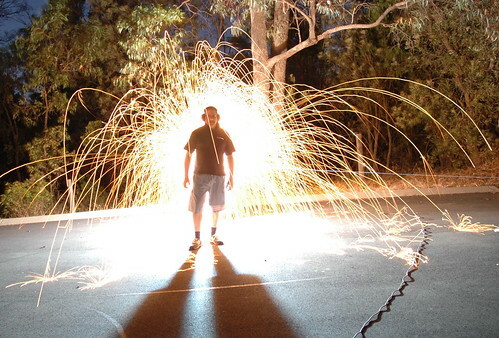 A lighning 'strike' is usually one or more very brief, high current pulses in very quick succession. Usually too closely spaced to differentiate by eye, but sometimes you'll see a lighning bolt 'flicker' - you are seeing successive strikes along the same (or nearly same) ionisation path. 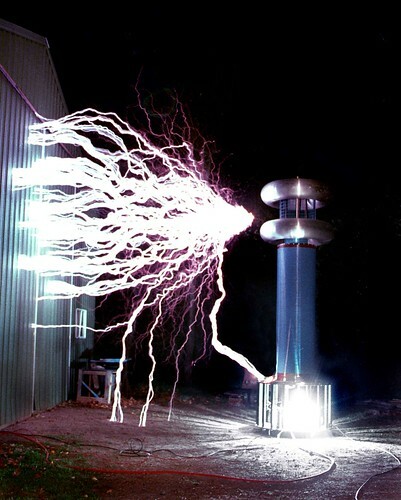 Tesla coils are high frequency AC resonant transformers, and the arcs are thus high frequency AC, with broad spectral content up into the Megahertz range due to the ringing square wave primary coil excitation. 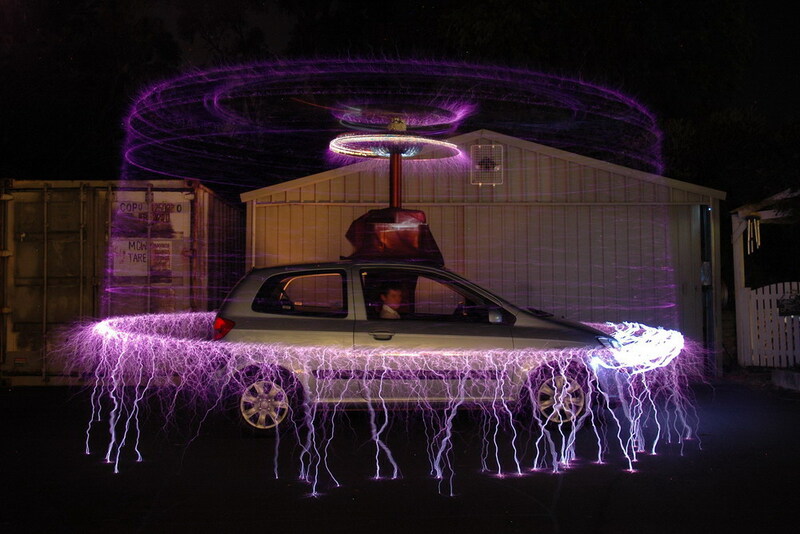 As a result, the visible behavior of tesla arcs is quite different to lightning. 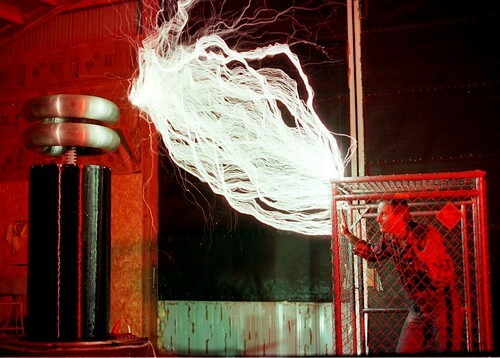 The processes in action are too complicated to explain in detail here, but the dominating ones are: point discharge, skin effect, persistence of ionization paths in air, charge mobility in air within the HF electric field surrounding the tesla coil head, and distortions of the field due to active plasma paths. 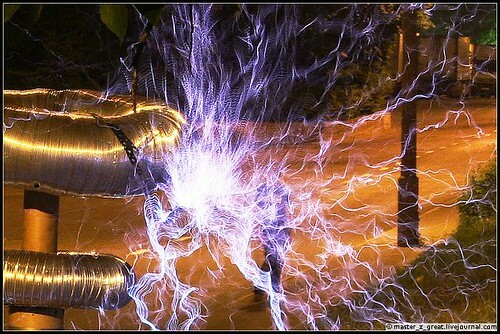 Which all intereact to produce the 'bushy' spreading arc tangles typical of Tesla coils. 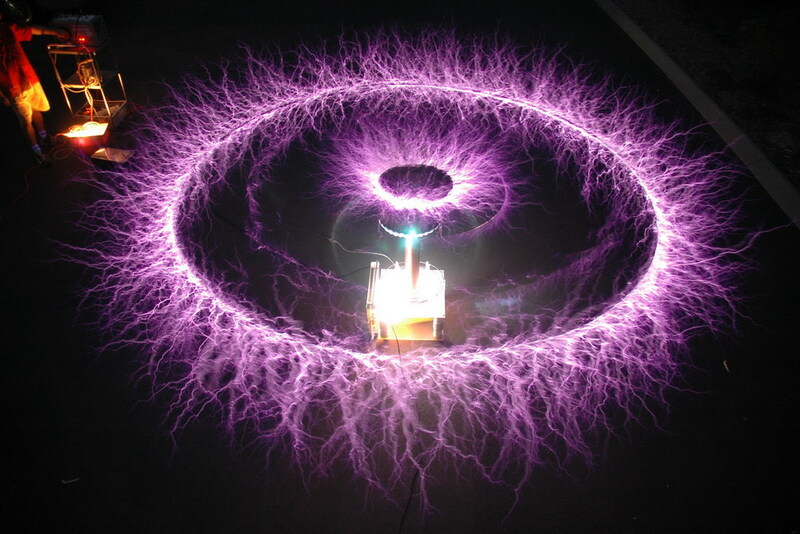 But, to address b. durbin's point, lightning (mostly) converges, but tesla arcs do actually diverge into the space around the coil, unless a single, direct arc forms to some nearby ground point. 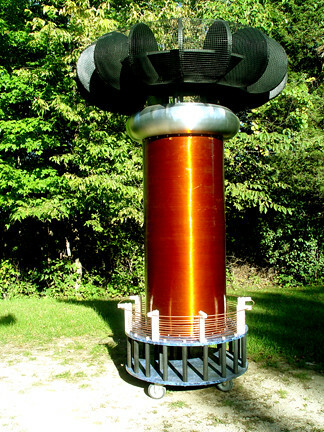 Its an AC current, and there is a single field source - the coil head. Hence, 'diverge' is a fair description. 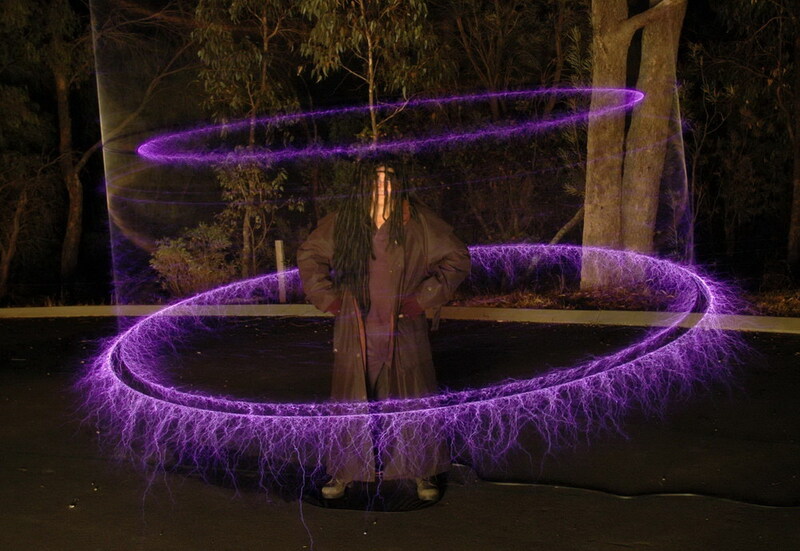 Btw, the photo of Tesla surrounded by arcs is a double exposure he arranged. Documented, sorry don't have ref handy. 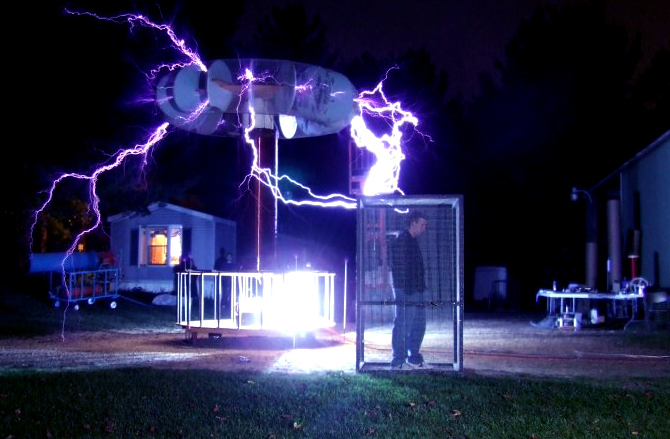 The singing Tesla Coil is from Arc Attack. To get the different tones you hear, they are turning the coil on and off at the frequency of the desired note.